On May 23, 2016, Asian and Pacific Islander American Vote, Asian Americans Advancing Justice and AAPI Data released voter survey results in a report titled “Inclusion, Not Exclusion: Spring 2016 Asian American Voter Survey.” The Asian American identity categories detailed in this survey are as followed: Asian Indian, Chinese, Filipino, Japanese, Korean, and Vietnamese. Main findings of the survey reveal that exclusionary rhetoric has pushed Asian Americans to identity as Democrats, and evidence indicates that “Asian American registered voters…will punish candidates with anti-immigrant and anti-Muslim views” (Report 2016, 1). Many Asian Americans identify with the immigrant narrative. From the Chinese Exclusion Act of 1882 to the Immigration and Naturalization Act of 1965, Asian Americans have faced legal obstacles to come to the United States. Identification with immigrants that are currently under attack by exclusionary rhetoric may reflect why Asian Americans disapprove of anti-immigrant stances. Furthermore, members of the Japanese American community have been active in organizing solidarity movements with Muslim communities. In the shadow of Japanese American internment during World War II, Japanese American communities today strive to avoid the persecution and internment of specific groups, particularly American Muslims in the aftermath of 9/11. 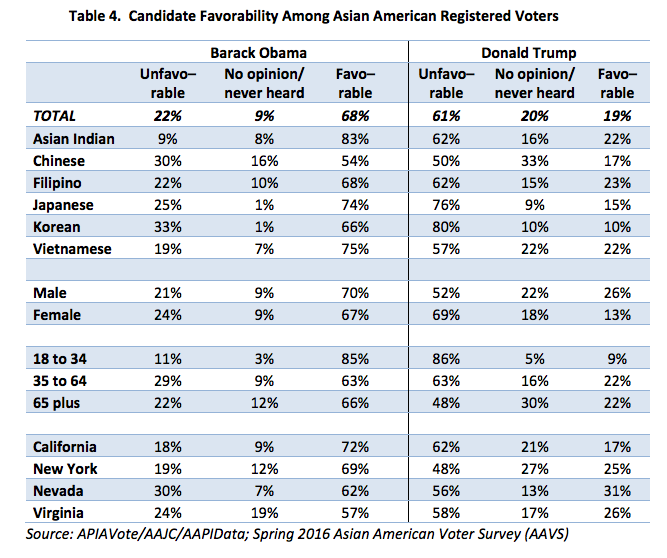 Furthermore, the Asian American dislike for exclusionary rhetoric is reflected in unfavorable views of Donald Trump (see Table 4 below). The anti-immigrant and anti-Muslim attacks espoused by Trump mark an exclusionary rhetoric. In terms of politicians campaigning for the presidency, the survey indicates Hillary Clinton has the most net favorability among Asian Americans. Asian American voters have great potential in shaping elections in the 21st century as Asian Americans continue to be the fastest growing immigrant population in the United States. Despite the growing presence of Asian American voters, an NPR article reports that Asian American voters continue to be the least likely to vote. To continue, a May 2012 APIAVote/AAJC survey “indicates that Asian Americans were less likely than other racial groups to be contacted” (Report 2016, 29). It seems like larger organizations are not on the the Asian American electorate bus, so it is important for community organizations to put effort into mobilizing Asian Americans to vote. Many diverse communities should come together to compose the Asian American identity and have those community voices be heard. We need to untap the political potential of Asian Americans to shape elections. Our Cultures Are Not Your Costumes!